Imagine you took a world-class business writer and asked him to rate the quality of several pieces of content in a blind test. Would he be able to tell which ones were created by humans and which ones were produced by automated writing? Given that Mark is one of the most respected speakers and writers on marketing, with a successful blog, an impressive audience and numerous publications, I wouldn’t blame you if it sounded so. But while his post focuses on what human content marketers can do to write better content and combat robots, I’d like to elaborate on how artificial intelligence (AI) can benefit human content marketers. To fight or embrace artificial intelligence? This is the question content marketers are facing. Rather than viewing artificial intelligence as a threat, why not look at it as an opportunity? 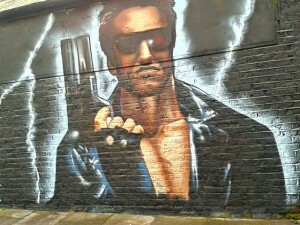 This isn’t Terminator – at least not yet – so we don’t have to choose between being for or against machines. Humans who leverage technology typically do a much better job than algorithms alone or humans alone. As an engineer who coded neural networks back in the 90’s, I believe in “humanrithm” – hybrid systems where AI helps humans but keeps them in control. Here are several ways technology and AI in particular can exponentially improve your content marketing today – no science fiction involved. Can your gut tell you what to write about? Maybe. But you’re not creating content in a vacuum. Your content will compete for limited attention with tens or hundreds of other different posts. When I use the word compete, I don’t mean content created by competitors. But the attention span of your target audience isn’t limitless, which means it’s highly likely they prefer to read other blogs, writers or publications for a multitude of different reasons. By identifying trending content with your selected keywords, you can better understand what topics resonate best with your audience, what trends are growing in popularity and use this information to form a much better idea of what to write about. Analyze hundreds or thousands of posts on relevant topics and discover keywords successful content typically uses (and those that you should consider using too). Analyze the performance of all of your content to identify keywords you’ve used successfully in the past but that you haven’t used recently. Content curation is a great way to engage your social media followers and even supplement your own original content with curated posts – that typically are 4x faster to write than original content. And curation doesn’t just help create more content: it helps create better content as third-party content is 4 to 7x more credible than your own. Automated content discovery has been around for some time but AI brings a new dimension to it and can help you focus: for instance by detecting patterns such as trending content that you might want to pay more attention to. Unless you’re a trained writer (or literary scholar), odds are you can probably write fast or well – not both. But quality matters as much as quantity and consistency for content marketing success. Even if you’re trained, chances are you’re not an SEO expert, let alone an SEO expert who can check dozens of various rules in just a minute. Plug-ins like Yoast can check your content’s readability as well as whether it complies with the most important SEO rules. If you want to learn more about how to format your content for better readability and SEO, check out this article. In a world where the organic reach of Facebook pages is a lowly 2%, betting your entire content investment on just a few shares is the equivalent of burning cash. Due to the reality of content shock, content marketers today require more sophisticated strategies involving multiple channels, programming, email newsletters, organic and paid, etc. This may all sound pretty complex, and it is. And there’s more: all of these strategies need to be coordinated to create a comprehensive distribution cycle for each piece of content that can span over the course of several months. What’s at stake here is not marginal: organic content amplification of evergreen content can generate up to 3x more traffic or leads. So how can you manage dozens of posts, hundreds of publishing events over several months? There are an overwhelming number of posts out there on content marketing best practices. You’re probably more than familiar with them already. These include posts with titles like, “What time should you publish on Facebook?”, “How many time should you publish on social media?” or “When should you send your newsletters?”. I’m assuming you’ve read them all, right? The problem with these types of posts is that they generalize things that are fundamentally specific: your audience. Why should it matter that BuzzFeed is more successful doing this or that if you’re trying to sell to middle-aged CFOs? The sad truth about optimizing content marketing is that it’s different for everyone: what works for others won’t necessarily work for you. So you need to find out from your own data what correlations are relevant for your specific industry, your brand and your audience. This means a lot of data crunching and a graduate degree in data science. Or you can use AI. In his blog post, Mark makes an excellent point: AI can be scary to a lot of professions and it makes total sense to anticipate its predicted pervasiveness by stepping up our game as humans. But we won’t do so by ignoring its existence and refusing to leverage its benefits. 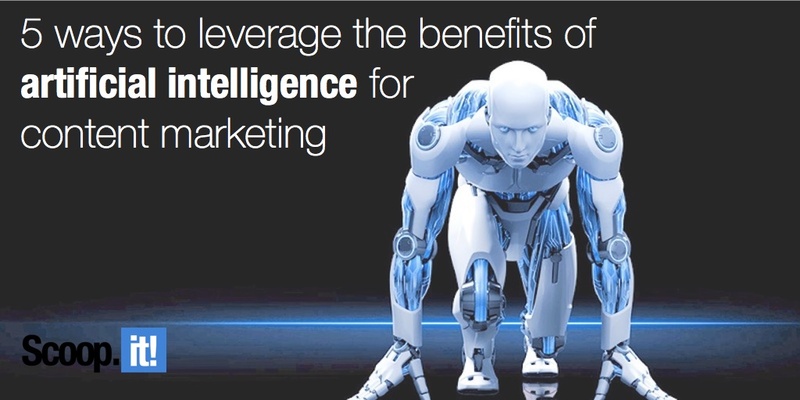 For content marketers, leveraging intelligence – whether artificial intelligence and technology-assisted human intelligence – is a real opportunity now. Want to create better content in less time? Get more results from your existing content? Find out how artificial intelligence is changing the content marketing game by providing marketers with actionable predictive insights to help them create better content that generates more traffic and leads! 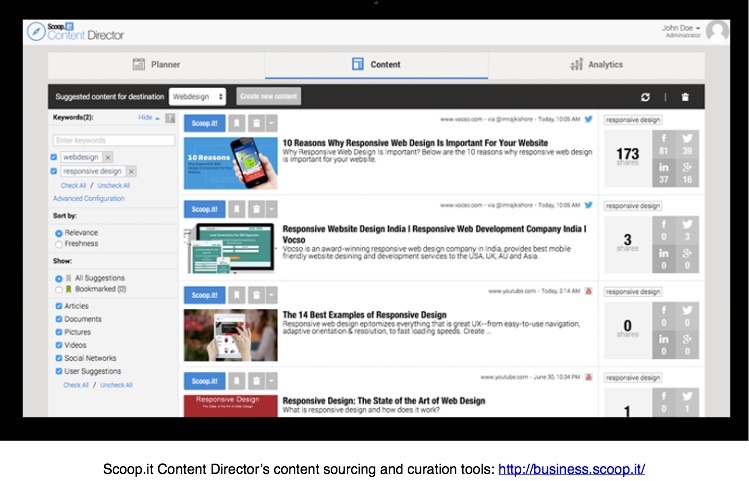 Find out how to use the new Scoop.it Content Director to help you become a smarter marketer! 2 Comments on "Don’t be afraid of the content bots: 5 ways to leverage the benefits of artificial intelligence for content marketing"
I’m also very curious about the artificial intelligence. I even published a short article here about TensorFlow ( the Google’s neural network software project). However, I’m a total beginner in SEO. That is why I started reading your Blog. I would like to explore SEO and embrace the artificial intelligence. Could you kindly advise me what should I start with to make my content more SEO optimized? Hope you like our resources!